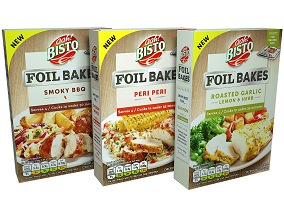 Premier Foods, the UK food manufacturer, has announced an extension to its Bisto brand range with the launch of Bisto Foil Bakes. According to the company, each product includes a packet of flavouring mix and a foil bag complete with a steam vent window. Consumers are instructed to use chicken, fish or meat, rub it with the seasoning and then bake in the oven. “The premium foil baking bag infuses the meat, delivering melt-in-the-mouth midweek meals every time”,the company claimed in a statement. Bisto Foil Bakes come in Roasted Garlic Lemon & Herb, Smoky BBQ, and Peri Peri flavours and is being retailed at an RRP of £1.59 ($2.07). The range is said to use real herbs and seasonings, 100% natural flavours and no artificial colours. Commenting on the launch, Helen Touchais, brand director, flavourings and seasonings at Premier Foods, said: “We know from past experience that although shoppers want convenient, easy to use products, they are not willing to compromise on taste and quality. This has led to a desire for premium ranges and we’ve seen success in this area with Bisto Best. Our new Bisto Foil Bakes range comes with a quality foil bag which is fuss free and an ideal way to inject a burst of flavour into midweek meals. Looking at the current landscape of the bake in bag market, we need to offer retailers a solution which shoppers will be willing to pay more for to help accelerate value growth”.